I'm excited today to host Robert Jacoby, author of the clever new novel There are Reasons Noah Packed No Clothes. The book features a troubled teen who finds himself in an inpatient unit after a terrible overdose. It's a neat, experimental book on a topic very important to me. You'll get a review from me next week. Until then, Robert has some great things to tell you about the book and writing! And he's also generously giving away a copy of the book, so don't forget to enter! You need your eyes, don't you? So does Richard Issych. Two weeks ago he overdosed. Now he's fighting for his life, finding threatening notes like that one on his nightstand. 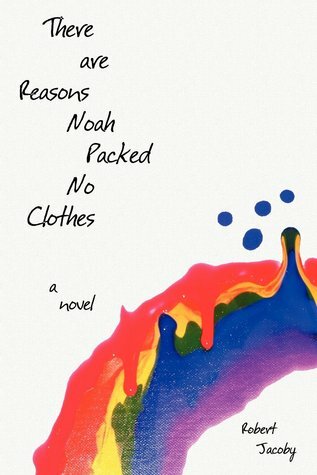 "There are Reasons Noah Packed No Clothes" is the story of 19-year-old Richard Issych, who wakes to a harsh new reality inside an inpatient unit. Now Richard's journey turns into one of revelations and struggling through his own reasons for being as he discovers new meanings for redemption, sacrifice, hope, love-and the will to live. In the end, what are the reasons Noah packed no clothes? Richard can only imagine. But it has something to do with a size 3XL bowling shirt with the name "Noah" stitched over the pocket. There are reasons . . . everyone uses his own dictionary. There are reasons . . . some new heavens come from some new hells. So, let’s start with a bit about you. What was your favorite childhood read, and what is your favorite adult read? Childhood: Twenty Thousand Leagues Under the Sea. It was a world like no other I had ever imagined. I cried when I finished that book; I didn't want that world I'd entered to end. Adult: The Iliad, Alexander Pope's translation. I read it in my mid-20s, and I had never read anything like it before. I did not understand what "epic" meant until I finished this book. What contemporary authors do you enjoy? Of living authors some that immediately come to mind are Don DeLillo, David Plante, Cormac McCarthy, and Jonathan Franzen. I recently discovered Richard Powers, too. Now let's talk about Noah. What scene from Noah did you most enjoy writing? I had the most fun when the four young men are on the beach discussing what they want to do for their day out. It was something about the "freedom" they each were feeling there, and that nearly anything could happen. I was feeling it, too, and I wanted to let them all loose, just be who they are. Tell us a little bit about the process of publishing Noah and what choices you made along the way. I worked very hard at the agent/publishing house route first. For a couple of years I went to workshops, conferences, sent letters and book proposals. At the start I knew my chances were slim to none because "Noah" is literary fiction, not genre fiction. When your first novel is "literary fiction" and you're not from an MFA program, I think it's nearly impossible to be taken seriously. I did get some interest, though. At one conference I showed the first few pages to the agents. Now, at the time, I understood that you were, under no circumstances, supposed to do that. Agents, we were all told by the conference organizers, did NOT want to see your written work. They wanted you, the writer, to explain to them what your book was, why they should be interested in it, why you were special and should be published, what was your platform, etc etc. Platform? I looked around me at all the other writers, mostly women, and I thought about all their books, the romances, the werewolves, the teenage vampires and magicians, and I thought: I'm sunk. It sounded all wrong to me. I thought: I'm a writer; I could care less about "platform"; you should want to read what I've written to see if you want to publish it. (I'd been writing for years by this point and had poems and a short story published--and I'd also been accepted to two creative writing MFA programs [but could not go; that's another story]--so I knew my writing was worth publishing; so it was not, to me, a matter of wondering if my work was "good enough" to publish, I already knew it was. It was "merely" a matter of finding the right publisher.) I had printed the first few pages of the novel and brought it with me. When I sat down with the agents I stumbled through my explanations of what the story was about and could see the disappointment in their faces: Oh. No dystopian future, no zombies, no romance in outer space. I reached for my pages, and they hesitated, but relented, in both cases, to read. The one agent read the first page, flipped the next page, read, flipped the next page, read, flipped and read some more. She put it down. I asked her what she thought. She said the writing was “remarkable” and said, “It’s one of the most powerful opening paragraphs I’ve read in a very long time.” She gave me the name of another agent to send the book to, because she said she wasn't representing literary fiction. When I sat down with the other agent, the owner of his own literary agency, and did the same thing, he looked pissed, almost like he was going to call over one of the conference organizers. But he took the pages, very grudgingly. And he read down the opening page, all the while kind of looking down his nose at me and the page, almost holding it at a distance. When he was done with the first page he looked up over it at me and said, "You have a full manuscript of this? Is the book done?" When I nodded and said "yes" he set the pages down on the table and said, "I'm going to give you the name of someone at my agency. I want you to send the entire book to her." Then he handed me a card with one of his agent's names on it. In both cases I was thrilled. Over the moon. My work (this novel) had been vindicated. Even, for the one guy, on the basis of just the opening paragraphs! I floated out of that conference. But it all ended the same: "Good writing; but there's no market for it, and we can't take the chance." So, I decided to take my own chance and do it myself. What inspired you to write about mental illness? I think American society has a lot to learn still about depression and mental illness. We pride ourselves on our knowledge, but depression and mental illness are still very misunderstood, generally. I think this is partly because it seems frightening. And what people can't always understand frightens them. I think this is because in some ways it's intangible. It does not seem real because there is no "in your face" symptoms. Consider a physical problem like a broken arm. We can see it, feel it, fix it, and then be done with it. The pain the patient exhibits is understood by all. And there's something we can do about it. But depression and many other mental illnesses don't always work so neatly. Many times you can't see the symptoms, and, sometimes, even the person suffering the symptoms doesn't know (or won't admit) he or she needs help. In other words, it's easy to see when the body is hurt, but it's not so easy to see when the mind is hurt. I wanted to write a novel to show this. I wanted to write a novel that explored how someone thinks in this ill manner, how it affects his worldview, and how it affects his life. I wanted people reading to feel that life, to feel as if they were actually in it. I also wanted to reach people who might be suffering, too, just to say, "It's OK. I get it. You're not alone." I think there's a great alone-ness, a shunning, that comes with what our society has deemed to be mental illness, and I wanted to write a story that might begin to break down some of those walls. And that could be by just starting a conversation at a book club, or between friends. What was it like writing from the point of view of a severely depressed person? It was very difficult. Sometimes it was really quite uncomfortable. Very often it was like channeling those emotions onto the page, as I was writing, so at times it was exhausting and even depressing my own mood. At times I had to choose to work on "lighter" parts of the novel just to avoid the "heavier" parts. What do you hope people will come away with after reading Noah? I hope people will have a new understanding of what depression and "mental illness" is. I hope those suffering from depression might see a bit of themselves in the story and know that paths to wellness exist in many different forms. The ending of the novel has confused some people. Without giving anything away I'll just say: I wrote the ending to be true to the entire story of what had gone before. And I wanted the ending to be true to the violence and disorientation that often accompanies a spiritual awakening (a re-birthing). So you're working on another novel, Dusk and Ember. What can you tell us about it? Very little, sorry. It may take another title. Generally, now, it's a prequel to "There are Reasons Noah Packed No Clothes." I don't want to talk too much about it because that would diminish its power and hold within me and lessen my abilities to let it form within me the way it should. It's a risk to take unusual forms, like poetry, and apply them to fiction. How does your style mesh with Richard's story? You're right, it is a risk. I hope it's worked well with Richard's story. The reader will have to judge that for himself. As I was writing certain sections of this novel it felt that there literally were no words in regular sentence format to express what he was feeling. I experimented with a number of ways of showing this to the reader. In the end, what felt right and natural was for me to let my poetic instincts take over and to simply try to form feelings from words. Certain sections of the book went through many revisions. I lost count of how many times I revised the last 3 or 4 pages. I have an image in my head of a woodcarver sitting and working on a piece of fine wood in his hand, carving and sanding and smoothing and polishing until it is just so. My grandfather carved wood. Maybe that's where that image is coming from. The obligatory last question: what advice do you have for aspiring authors? Be a student of life. Read and write, a lot, and carefully. If you're looking for a good teacher of serious writing, start with John Gardner and his two books, On Moral Fiction and On Becoming a Novelist. Wow, this sounds good. I especially like that it's set in an inpatient mental health facility. Definitely adding it to my To Read list! Definitely cool, very much out of the tradition of Susanna Kaysen. Hurrah, glad to show you a good one!